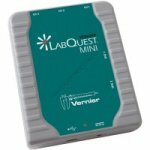 LabQuest Mini brings the power of Vernier's award-winning LabQuest technology to teachers who don't need the versatility of a standalone device. LabQuest Mini is the perfect data logging solution for educators collecting data with a Windows or Mac computer. It works with Logger Pro 3, Logger Lite or Graphical Analysis for Chrome software for unparalleled power, analysis and curricular support. • 100,000 samples per second maximum sampling rate gives the unrivaled power of LabQuest. • Five sensor ports provides the flexibility to choose from over 50 compatible sensors. • Logger Lite software (included free) gets students collecting, graphing and analyzing data easily. • Compact design and USB powered for quick and easy set up. No power supply required.